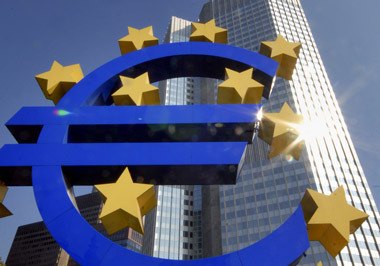 The European Central Bank unexpectedly cut interest rates and announced a bond-buying program. European stocks rose with bonds while the euro weakened to its lowest level in more than a year against the dollar as the European Central Bank unexpectedly cut interest rates and announced a bond-buying program. The Stoxx Europe 600 Index climbed 0.8% at 9:31 a.m. in New York and the Standard & Poor’s 500 Index advanced 0.1%. The euro weakened against all of its major counterparts. The yield on Germany’s 2-year debt dropped 5 basis points, while 10-year rates in Italy and Spain lost as much as 7 basis points. Benchmark Treasury yields rose 2 basis points to 2.42%. Nickel increased 2.2%, while crude oil fell 1% after rallying 2.9% yesterday. The ECB will start buying securitized debt and covered bonds, potentially easing the flow of bank funding for the region’s faltering economy. The central bank reduced all three of its main interest rates by 10 basis points. Ukrainian President Petro Poroshenko said he’s ready to declare a cease- fire if peace talks with pro-Russian rebels take place as scheduled tomorrow. The eurosystem will “purchase a broad portfolio of simple and transparent securities” and euro denominated covered bonds, ECB President Mario Draghi said in a press conference in Frankfurt. In committing cash to the market for asset-backed securities, Draghi is making good on his pledge to help rekindle an asset class that can funnel loans to the real economy and ease funding conditions for the region’s banks. The ECB reduced all three of its main interest rates by 10 basis points, dropping the benchmark rate to 0.05% and the deposit rate to minus 0.2%. A reduction in the benchmark rate was predicted by just 6 of 57 economists in a Bloomberg News survey. The Bank of England held its benchmark interest rate at a record low. Euro-area inflation languished at 0.3% last month, far below the ECB’s 2% target. Draghi said details of the program will be announced after the October rate-setting meeting. The euro weakened 0.9% to $1.3026, its lowest level versus the dollar since July 2013. The yield on Italian sovereign debt slid 7 basis points to 2.38%. The rates on French and Spanish 10-year bonds declined 4 basis points to 1.30% and 9 basis points to 2.18%, respectively. Forty-five percent of all government bonds yield less than 1%, Bank of America Corp. said, as central bankers in Japan, Europe and the U.K. decide on how to support their economies. Speculation that the ECB would start buying debt in the year ahead had pushed the yield spread between U.S. 10-year Treasuries and German bunds toward a 15-year high and German 10- year yields to a record low of 0.866% last week. European equities reversed an earlier decline as insurance companies rose. Standard Life Plc jumped 6.2% after agreeing to sell its Canadian business to Manulife Financial Corp. for C$4 billion ($3.7 billion). Iliad SA advanced 5.3% after Nomura Holdings Inc. said that the French telecommunications operator’s bid for T-Mobile US Inc. presents Deutsche Telekom AG with its best opportunity to exit the U.S. before an auction of spectrum. The S&P 500 fell from an all-time high yesterday as Apple Inc. tumbled and investors assessed the prospects for a resolution to the conflict in Ukraine. The benchmark index gained 3.8% in August, the biggest monthly increase since February, amid positive economic data and investor expectation that central banks will continue to underpin global economies. Data today showed applications for unemployment benefits in the U.S. were little changed last week as an improving economy prompted businesses to retain staff. A private report on payrolls indicated U.S. firms added 204,000 jobs in August, fewer than the 220,000 estimated in a Bloomberg survey of economists. The monthly Labor Department jobs report due tomorrow will show that companies boosted payrolls in August by more than 200,000 for a seventh-straight month, according to a separate Bloomberg survey. The yen weakened against most of its 16 major counterparts. It slipped 0.2% to 105.04 per dollar after rising 0.3% yesterday, its first increase in four days. The currency reached 105.31 per dollar yesterday, its weakest intraday level since January. The Bank of Japan kept its pledge to increase the monetary base at an annual pace of 60 trillion yen ($571 billion) to 70 trillion yen, it said in a statement today, in line with all 31 economists surveyed by Bloomberg News. The MSCI Emerging Market Index was little changed after closing yesterday at a three-year high. Samsung Electronics Co. rose 1.8% in Seoul after unveiling new phones, while Hon Hai Precision Industry Co., a supplier to Apple Inc., declined 1.1% in Taipei after the shares of the maker of iPhones and iPads slid 4.2% yesterday. Russia’s Micex Index added 0.6% after yesterday gaining the most since March 18. The ruble lost 0.3% after yesterday’s 1.6% rally. Ukraine’s hryvnia declined 2.8%. Emerging-market equities rallied yesterday after Russian President Vladimir Putin proposed peace terms for a conflict the U.S. and its allies say he is fueling. Putin agreed with Ukrainian President Petro Poroshenko on steps toward a cease- fire. Diplomats from the European Union’s 28 nations are discussing European Commission proposals to impose a second round of economic penalties, possibly by the end of the week. The Hang Seng China Enterprises Index of mainland companies listed in Hong Kong advanced 0.7%, its highest level since Dec. 9, and the Shanghai Composite Index rose 0.8%, advancing for a fifth day to its highest level in 15 months. Indian shares halted a nine-day rally, with the S&P BSE Sensex retreating 0.2%. Nickel climbed for a second day to $19,497 a metric ton. The Philippines should move toward banning mineral ore exports, the environment secretary said today, offering support to a bill proposing restrictions that may threaten nickel ore supplies to China. West Texas Intermediate oil declined 1% to $94.56 a barrel. –With assistance from Paul Dobson, Claudia Carpenter, Stephen Kirkland and Anchalee Worrachate in London.